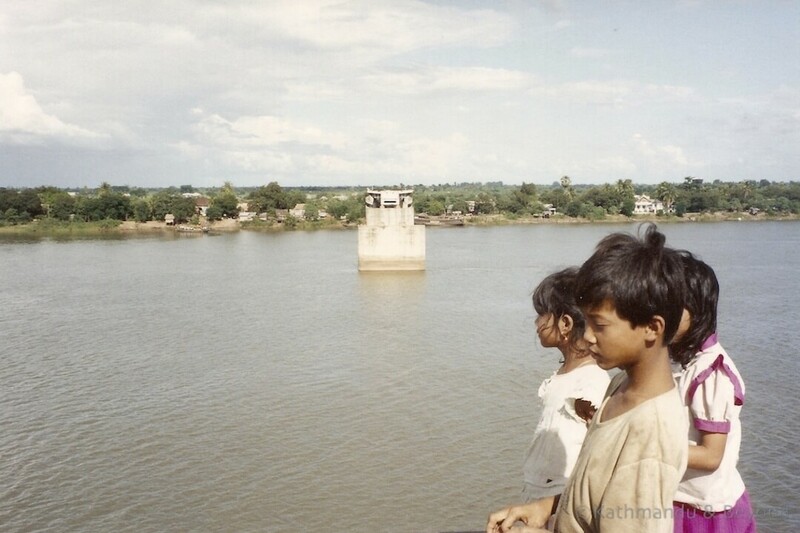 What was it like backpacking in Cambodia in the early ’90s? 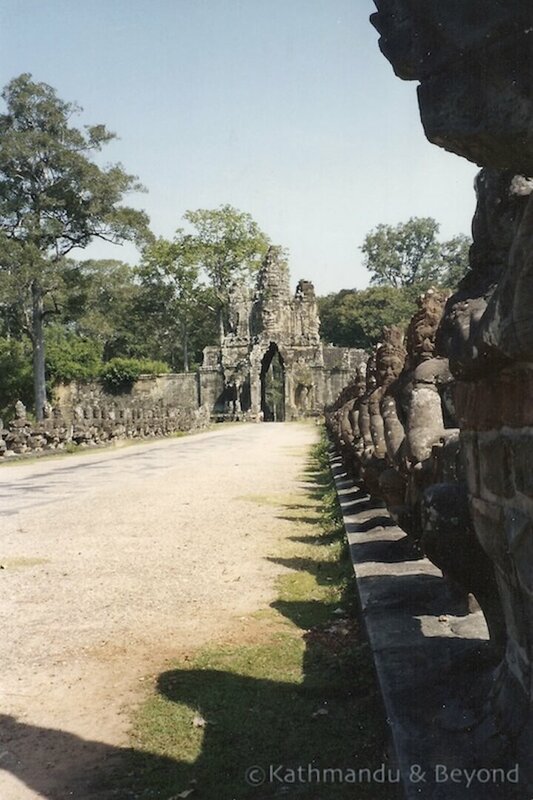 I first visited Cambodia in October 1992. Back then it was relatively easy to get a visa (courtesy of Bangkok’s Khao San Road travel agents) but options for entering the country were limited to just two. You either flew in to Phnom Penh on an old Russian Tupolev from Bangkok or you travelled to the likes of Koh Chang in south-east Thailand and paid a fisherman to drop you off on the south-west of the country. 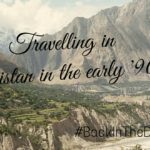 The second option was illegal and although I considered myself reasonably adventurous at the time having crossed China overland and walked practically the whole length of northern Pakistan because of horrendous flooding and landslides that occurred that year, I didn’t see the point in making life too difficult for myself so I opted for the flight. It was my first time on a Tupolev and I had no idea that the white smoke filling the cabin was actually water vapour created by the air-conditioning system. This was not good and I nearly got off the plane there and then, unaware this was normal procedure. Apart from that, the flight was uneventful and I landed in Phnom Penh about an hour later. The airport was dated but extremely busy with military personnel due to the presence of the United Nations Transitional Authority in Cambodia (UNTAC). UNTAC were a United Nations peacekeeping operation that arrived in Cambodia in March 1992 and left in September 1993. I won’t go into too much detail about their role in Cambodia but, in brief, its goals were to restore peace to the country, disarm the Khmer Rouge and oversea the 1993 elections. They had nice blue berets! There were six of us tourists on the flight and after we landed we all hooked up and pretty much stayed together for the rest of our time in Cambodia. First we needed to find somewhere to stay. This is normally a pretty straightforward task in Asia but with UNTAC bringing with them approximately 22,000 military and civilian personnel, it made the job not only difficult but also expensive. It is normal for an influx of expats to mean an increase in demand and costs but you drop thousands of them into a small city with pretty much no infrastructure and you’ve got some serious supply and demand issues. We were reasonably lucky in that our team of moto drivers at the airport (remember there were six of us), knew of a place. 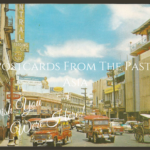 It turned out to be the Capitol Guesthouse, which went on to become a Phnom Penh institution but at the time it was relatively new and at US$50 per room per night a bit of a bargain for the city back then. In comparison, you can get a room there today for as little as US$8! We spent a few days taking in the ‘sights’ – the Killing Fields at Choeung Ek (now in the suburbs of Phnom Penh but in 1992 deep in the Cambodian countryside), Tuol Sleng (the site of the notorious Security Prison 21), the former French Embassy etc. All pretty sombre stuff but certainly not the commercial ‘tourist attractions’ that they are today. Another interesting facet of the city at that time was its nightlife. UNTAC military are still troops and troops have money on the hip and need entertaining. There were go-go bars galore and to me, it felt a bit like how Saigon must have been during the Vietnam War. Indeed one (of a number) of the criticisms of the UNTAC period was that it led to a large increase in prostitution and the probable introduction of AIDS into the country. I don’t want to comment on whether this is true or not, but certainly Phnom Penh was a lot more rocking (and shocking) than I was anticipating. Nowadays you can drive from Phnom Penh to Siem Reap in as little as 5 hours. In 1992, you had the option of either driving for at least 18 hours (if you were lucky) along the (then) appalling National Highways 5 and 6 or taking the train from Phnom Penh to Battambang, overnighting there and continuing via a shared truck to Siem Reap the next day. Both were long and arduous plus we had to return the same way (taking an internal flight was too scary an option at the time) in order to continue to Vietnam, our next destination. Even though the train option was overall much longer, we decided it would be more comfortable as at least you could get up and move around every now and then. We got to the station at 5am and already the train was crammed with people and their possessions. The fare was US$1 all the way to Battambang. Alternatively, you could ride in the first carriage for free. This carriage was pushed rather than pulled by the engine train and was used to detect mines on the track – sadly it was completely full. Surprisingly we pulled out of the station on time at 6am and eventually we arrived into Battambang at 10pm that night, 16 hours later. 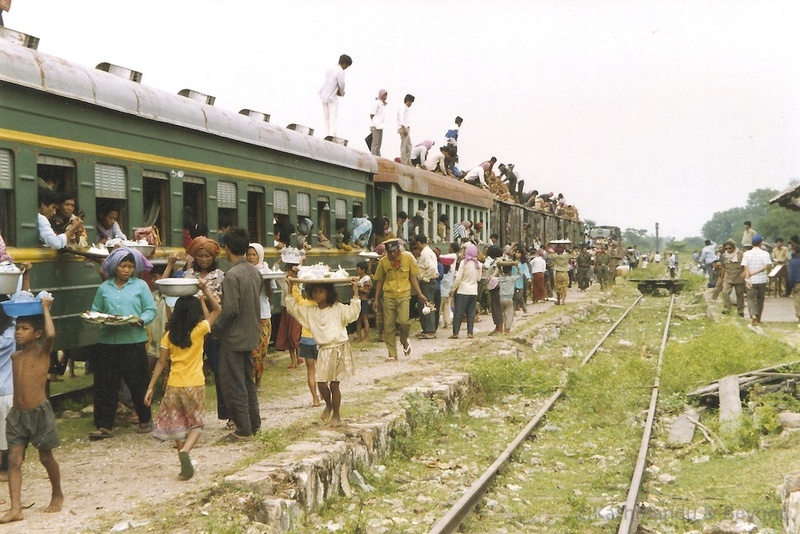 Looking back (I am a big fan of retrospective enjoyment from uncomfortable transport), it was one of the best journeys I have done in Asia – we met many wonderful Cambodians, rode on the roof of the train and generally had a good time. The train should have taken 12 hours – two of our numerous delays that stick with me were 1) a guy falling off the roof of the train and having to be fixed up before we could get going again and 2) a huge explosion in a nearby field. It was dark by this point and we had armed guards stationed at the end of each carriage. Their job was to protect the train against attack from the still active Khmer Rouge (another criticism of the UNTAC operation is that it failed in its goal of disarming the Khmer Rouge) and when a large explosion went off very close to our carriage the guards started firing into the night. The huge amount of then unexploded mines in Cambodia is well documented and given that there was no raid or return fire it was more than likely a large animal such as a buffalo or cow stepping on a mine but it scared the crap out of us nonetheless and the last couple of hours of travel in the pitch dark were pretty nervy. Just after the explosion, our immediate Khmer passengers told us to take our packs from the overhead racks and place them over our heads and bend down below the level of the window. I assumed this was for protection but later found out that it was to stop our gear from being stolen in all the confusion! Cambodia’s lack of accommodation combined with a late evening arrival did not make for a good combo and even the moto drivers didn’t have any suggestions. We had met a Dutch guy on the train who joined us in search of somewhere to stay and he got talking to some Dutch UNTAC soldiers who ultimately invited us all to kip on their floor in the large room in which they had been billeted. I have no idea where in the city it was but we were very grateful and slept well under the circumstances. The following morning we got up early and spent what seemed an eternity negotiating with a pick-up truck driver in order to get to Siem Reap. By 7am we were on our way. The road was in pretty terrible condition and we spent most of the 11 hours standing up in the back of the truck (where we were all located) rather than sitting down as it was the more comfortable option. The original gang felt that the Dutch guy was a bit too cocky for our liking and he certainly talked too much so when he decided not to get up as early as we did and come with us in the truck we didn’t kick up too much of a fuss. However when we arrived in Siem Reap, knackered, dirty and a bit wet (it had rained on us on more than one occasion), we were greeted by the said Dutch guy who was sitting on the front porch of the hotel with a cold beer in his hand. Perplexed by his earlier arrival, we asked him how he managed it? ‘Oh, the Dutch UNTAC soldiers gave me a lift in their helicopter,’ came the chirpy reply. ‘We even did a little turn over the temples. There was plenty of space in the chopper for you guys as well if you had hung around,’ he added. We disliked him even more at this point but were green with envy. We found rooms with relative ease for once. On the upside we only paid US$20 per room per night. On the downside, the place was knackered and completely run down – paint was crumbling off the walls, the swimming pool was an absolute mess and the wiring and electrics left a lot to be desired. The name of the hotel? The Grand Hotel d’Angkor. A few years later it was taken over by Raffles – it’s now pretty nice but quite a bit more than US$20 per night! We checked out the next day, upped our budget (!!) and moved into a family run guest house somewhere near what is now Pub Street. At the time, the guest house was a much nicer bet. We spent a whole week exploring the temples of Angkor (and mustering up the energy for the journey back to Phnom Penh). The entrance fee in 1992 was a ridiculous US$200 per person for a seven-day pass (a more reasonable US$60 today) but there were no ten-lane payment counters back then and nobody seemed interested in collecting our cash so we ended up not paying it. I admit we never entered via the conventional route but took our scooters off-road a little and waved and smiled at any security guards that we passed. 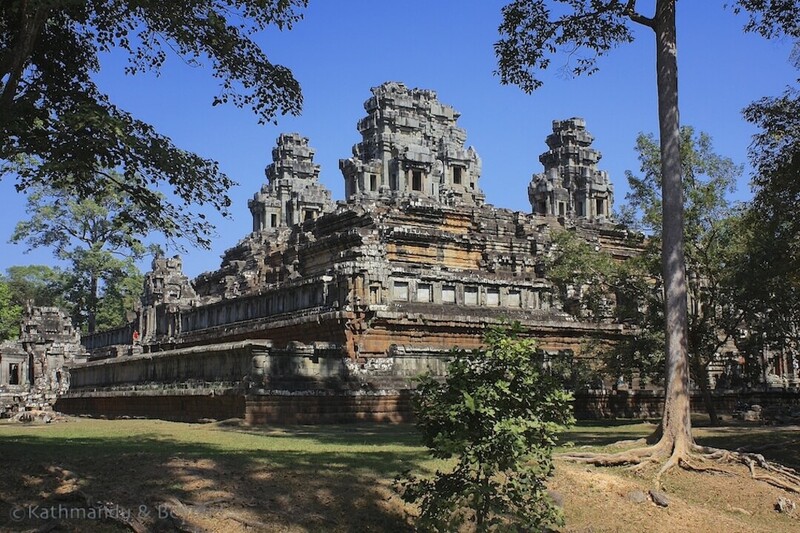 It would be rather smug of me to wax lyrical about how we had the temples to ourselves and hardly saw another tourist for the whole week but what else can I say – we did have the temples to ourselves and we rarely saw another tourist – sorry! 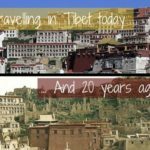 When writing this blog, it surprised me to find out that the temples only received UNESCO World Heritage status in December 1992. 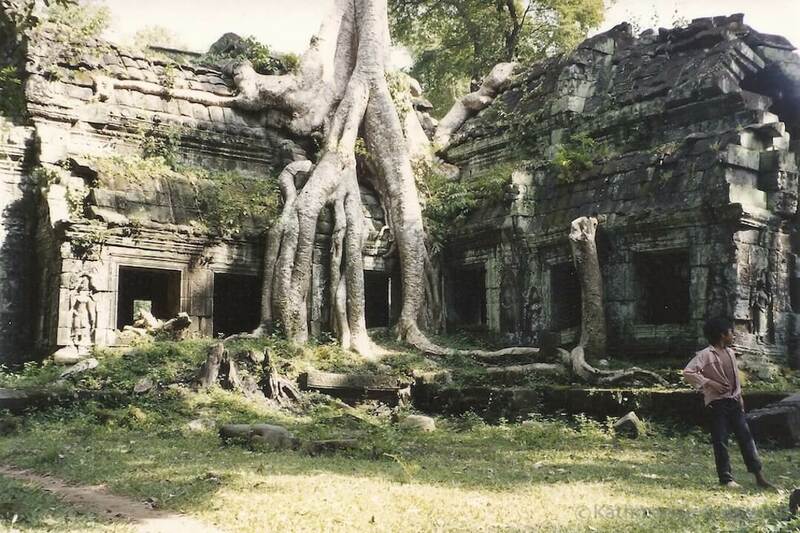 Moreover, according to the Tourist Office of Siem Reap, there were 10,530 visitors to Siem Reap in 1992 (608 British). 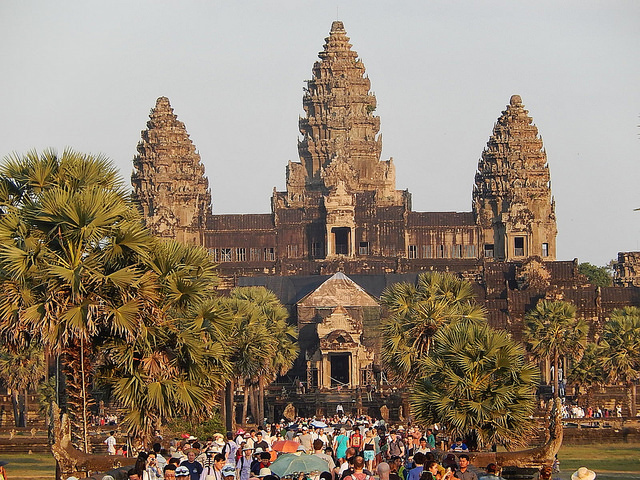 There were more than 2 millions visitors to the temples in 2013. On the downside, Pub Street and the Alley (*) didn’t exist at the time so our evening entertainment was limited to a few bottles of Angkor beer and a Khmer BBQ (I like Pub Street and the Alley) and it was very unwise to stray from clearly marked paths in and around some of the temples (including Ta Phrom) so we missed out on some of the more secluded spots that are now readily accessible but overall it was a brilliant time to experience what has to be one of the most impressive sets of ruins in the world. (*) Pub Street and the adjacent Alley are great places for eating and drinking near the Old Market and the hub of nightlife in modern-day Siem Reap. 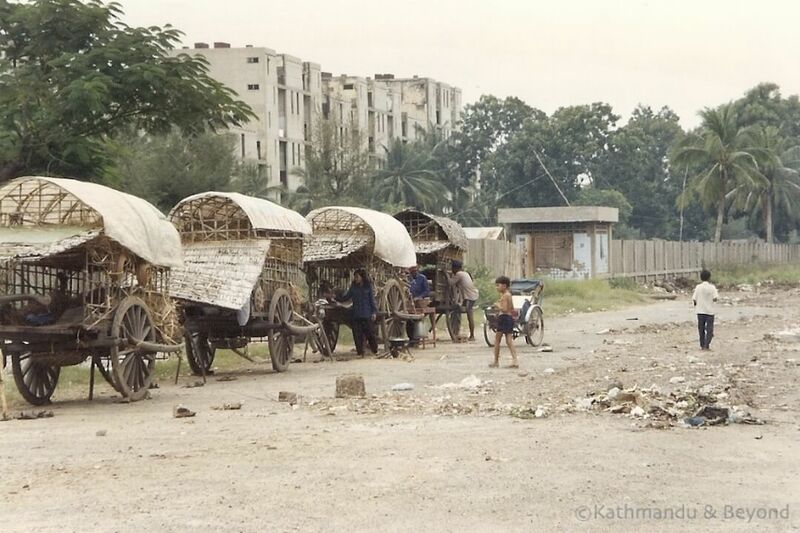 Enjoyed the blog on Cambodia – things can change so quickly. My how times have changed. I wish I could have experienced it before its 2 million visitors. 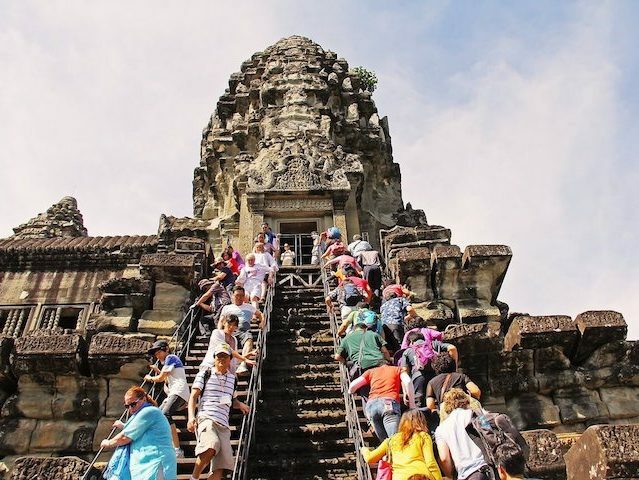 Yes, things are very different now but whilst you may have to share Angkor Wat with a few more people these days, it’s still one of the best sights in the world! And on the plus side many other temples that I couldn’t get to in 1992 have since become accessible. I’ve got a few more to come, yes. But writing them up makes me feel a bit old! we should meet for a beer so you don’t have to write them up 🙂 cheers! Great piece. I’ve been to Cambodia several times now, starting in 2006, and even in THAT time it has changed quite a lot. I still love going there, and it’s still rough around the edges. I’ve met a few who went there during the early 90’s and it sounded a bit Wild West. Thanks for confirming it with photos. 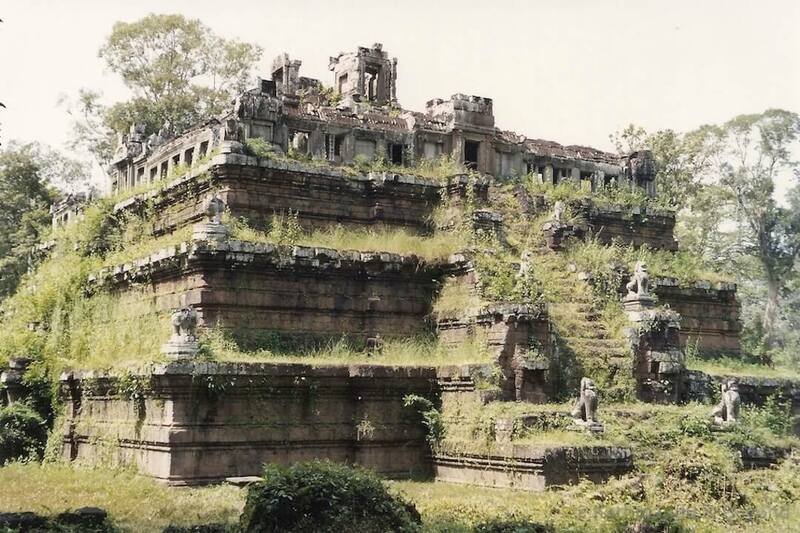 The pic of the nearly empty Angkor Wat says it all…. hahaha. Thanks, glad you enjoyed it. You’re right – it’s still changing but, like you, we still love re-visiting it. And Angkor is still amazing even if you have to share it a bit more these days! Glad you enjoyed the read. 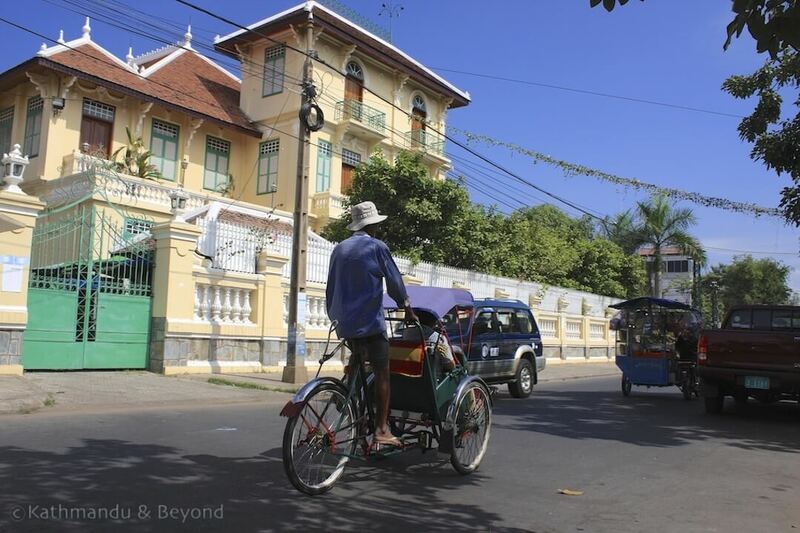 You’re right – Siem Reap is unrecognisable today compared to the sleepy town it was in 1992. Thanks a lot for this great article that gives a good idea of what Cambodia was like just over 20 years ago…as you say a great change! I hope you and Kirsty enjoy your current trip. Have a great time, and I hope to catch you soon somewhere in the world! Thanks Marc, glad you enjoyed it. I reckon it was more wild when we were there though? 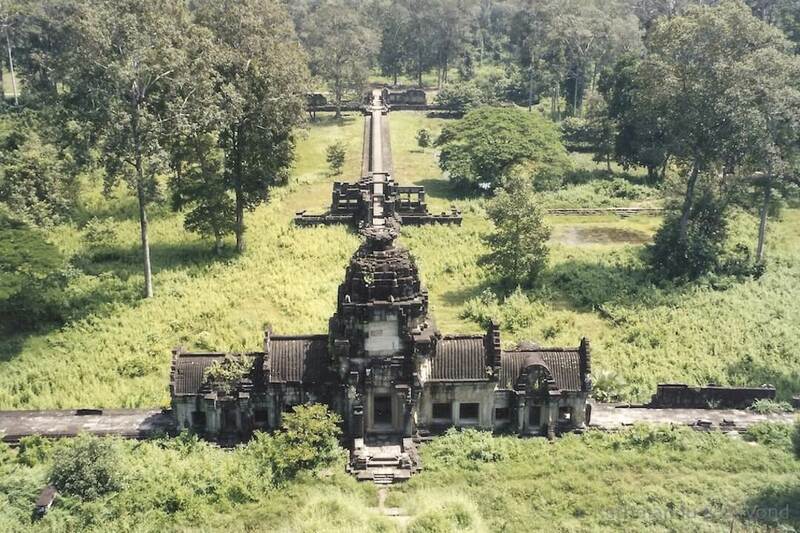 I looked into the history of Angkor Wat? Bar when putting this together. I think it came into being around 1994 and was a lone bar on what is now Pub Street – couldn’t imagine that now right? Hope you are keeping well, are you still in the arse-end of nowhere or have you left France and gone back to Tristan da Cunha – ha ha!!! I love the photos and the description of your journeys. It’s wonderful that you still remember them! While I wasn’t fond of the crowds and the platforms at Ta Prohm (probably necessary though because of the said crowds) when I went there recently, I wouldn’t like to give up the accessibility to the other temples on the big loop and beyond, or the assurance that it had been de-mined. Thank you! There is definitely a flip side to travelling lesser-discovered paths as more and more becomes accessible as time passes. The platforms have only been Ta Prohm for a few years, I can’t remember exactly when they appeared – but necessary to protect the temples. This is one of the coolest travel posts I’ve read. Thanks for sharing your photos! Thank you so much, I appreciate that. Glad you enjoyed it. Thank you Stuart. Flattery will get you everywhere – I’ll pop round with the envelope a little later!! Hi! It’s funny because I found your site on the wordpress Pinboard theme support forum, I also had issues with the slider but still not resolved. And this would be what I consider a happy little accident, absolutely love this post about Cambodia in the 90’s! 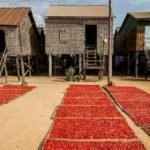 There are so many beautiful and interesting travel blogs/posts but it is so very rare to see posts that can show the progress of a country. Looking forward to reading more! I really enjoy this post – it is great that you still have the pics from earlier. Siem Reap was one of my favourite places that I’ve been to so it is really interesting to see how it has transformed. And I loved Pub Street! Hi Prianka, thank you for your comments and I’m glad you enjoyed the post. Funny enough we are heading back to Siem Reap at the end of the month. We haven’t been for at least a couple of years and I think it has probably changed in that short space of time. I feel another blog coming in!! Thanks for the nostalgic pictures. I have seen it about your time too & I am still here. You’re welcome! You will have seen many changes then no doubt? We return to Cambodia on a regular basis and see change ever time but the one that gets me the most is Pub Street (and the surrounds) in Siem Reap! Very interesting story, well done. Thanks, I’m glad you enjoyed it! !